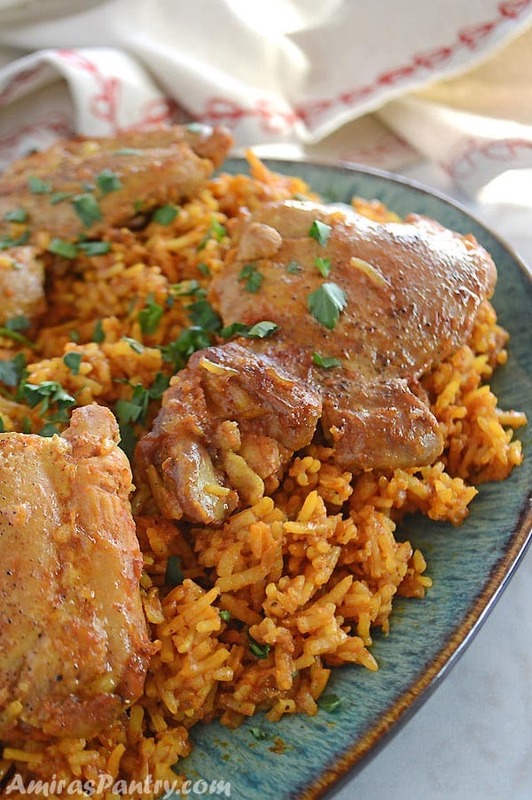 Kabsa is an amazingly flavored rice dish that can be made with chicken, beef or lamb. 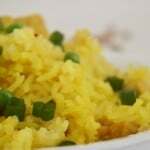 An aromatic rice pilaf one pot meal from the gulf area. 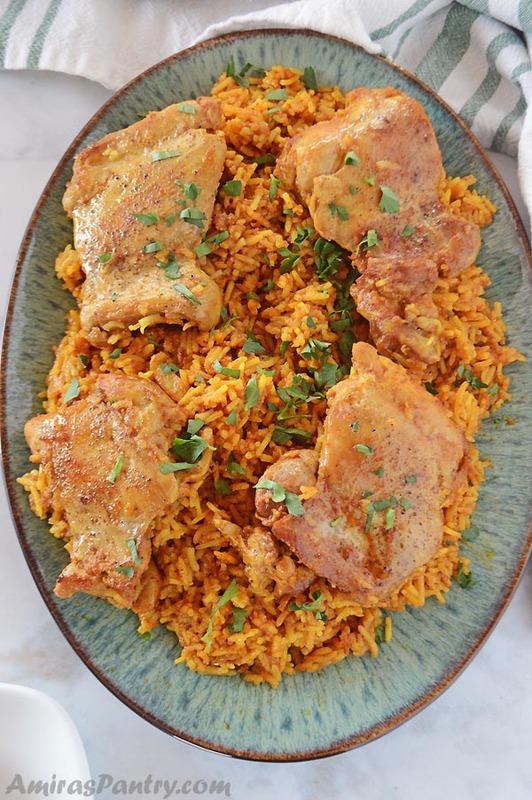 It is like having a flavorful rice and chicken kebab, all made in one pot. An exotic Saudi rice dish served with raisins and almonds. This crowd-pleaser recipe is often the centerpiece of celebrations on the Arabian Peninsula. 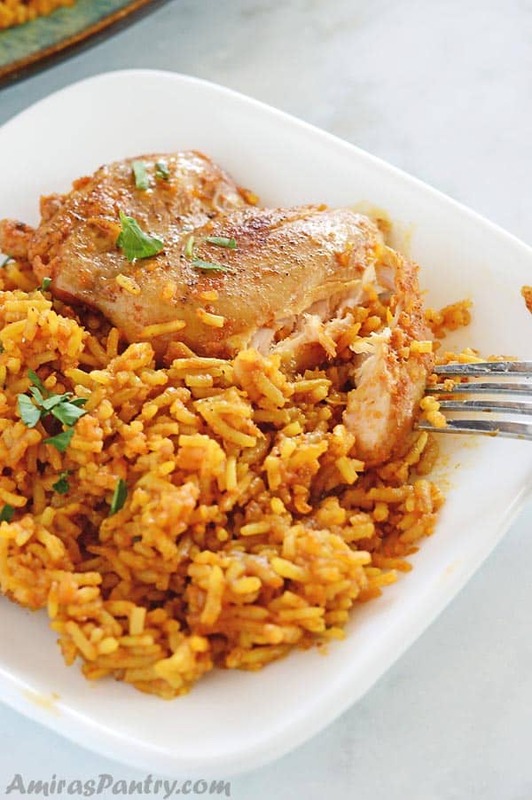 Kabsa is a traditional Saudi dish – and some people say it was originated from Yemen- that consists mainly of rice and meat. 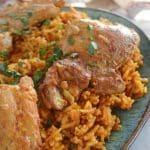 A deliciously spiced chicken and rice dinner usually made with lamb meat but you can use beef/chicken as well. I’ve seen Kabsa for the first time in my life when I was in Saudi Arabia and it was made at a wedding banquet. 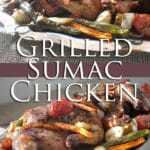 It is usually served in large plates with a big chunk of lamb meat on top of rice. 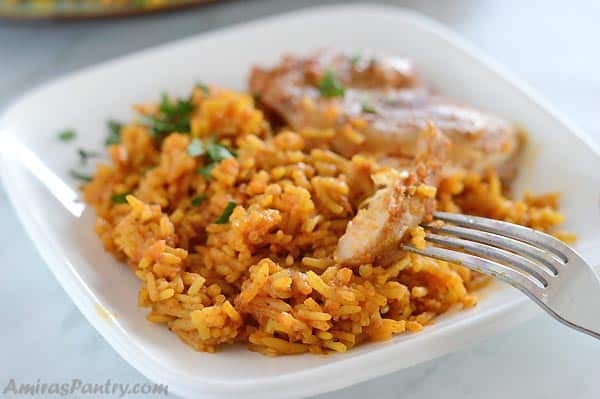 Kabsa is better be eaten- according to Saudi traditions- in large group of people while sitting on the floor and usually with no spoons as they prefer to eat it with right hands or at least this was what I’ve experienced. Today I’m going to make Chicken Kabsa. It is one of our family’s fav. dishes of all time. This dish can be made with bone-in or boneless chicken so feel free to use whatever best for your family, although I feel it is tastier with bone in chicken I’ve used boneless chicken so my kids won’t nag me about it. Can you cook raw chicken with rice? It is actually safe to cook raw chicken with other ingredients such as vegetables and rice. One pot chicken casseroles are convenient and safe as long as you cook chicken to the safe temperature which is 160 Fahrenheit. 2 Tablespoons 36g ghee/butter or oil. 1/2 Tablespoon 3g dry ground coriander. 1 (280g) Large onion , diced. 1 cup (200g) basmati rice, soaked in tap water for 15 minutes. 2 Tablespoons (40g) tomato paste. 1 1/2 teaspoon salt or to your liking. n a non stick deep skillet, heat ghee, add all the spice and stir for 2 minutes or until fragrant. Add garlic and stir for 20 seconds then add diced onion and stir for 3 more minutes. Add chicken pieces and cook for about 3 minutes, tuning to the other side halfway through. Add rice, tomato paste and salt then stir everything well to distribute tomato paste evenly. Pour water and bring to a boil, reduce heat, cover and continue to cook on low for 30 minutes or until water is absorbed. Turn heat off, uncover and let it set for a couple of minutes. Note1: It is highly recommended to use dry limes, you can easily purchase this from any Middle East store. If you cannot find it, then feel free to skip it. Note2: Use any sort of chicken you have. Feel free to use bone-in, skin on chicken pieces. I also made it with Cornish chicken and it was delicious. Note3: In my little home we like rice more with water than cooked with stock, but you can use stock for more flavor. Thank you Sameer and I will do my best. When I will come to Saudia I will taste …. But the King not invite me ! G’day! 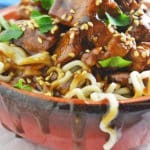 Your recipe and photo looks delicious, true! Thank you for sharing the largest one made and in allowing me today to learn something new through your blog post too! Thanks for passing by and for your sweet words…. I’ll sure go now check your blog .